Norah Larkin is a pretty operator of telephone which awaits impatiently the return of John, a soldier engaged in overseas with whom it must marry. The evening of their anniversary, she receives a letter of John talking him that he will not be able to marry her. In tears, she answers a phone call of Harry Prebble, a colleague of work, which confuses it with her sister and invites she to dine. 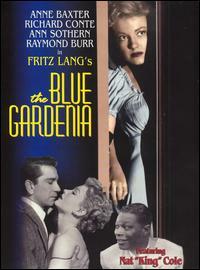 Depressed, Norah accepts the appointment in Blue Gardenia. Harry, who loves the pretty women, does not let himself dismount by his error and dines with Norah. He drunk the young woman before taking her along to his apartment where he tries to misuse her. Norah resists and strikes he with a poker before fleeing, leaving behind it her shoes and a blue gardenia that Harry had offered to her. The next morning, Norah is unable to remember what occurred.